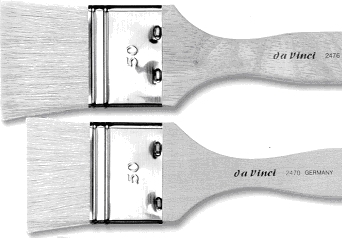 The Da Vinci Series 2470 varnishing brush is German made of soft, resilient white Chinese bristles. It has great holding capacity and is a single thickness brush, approx. 3/16". The hair comes to a chiseled edge. The hair is set in a tin ferrule mounted on a plain wood handle. Larger sizes are available.